How do you make a rich, smooth, delicious gravy without milk? Try our Cashew Nut/Sunflower Seed Gravy Base. More years ago than I can remember, Gloria began making gravy from cashews. It was wonderful. We loved it. Our girls loved it. Everyone who sampled it, loved it. For a long time, however, she still made milk gravy too. “It was the roux,” she said. “Yes!” Gloria said with a big, expectant grin. She knows that story and believes a good story needs repeating – many, many times. “You see, my Grandfather had an odd habit. He never asked, ‘Please pass the peas’ or whatever. He simply held his open hand toward the desired dish. Being a stern, no-nonsense person, he always received the the dish he pointed towards. By that time Gloria was in a spasm of giggles, and I had no choice but to join her. Back to Cashew/Sunflower Seed Gravy Base. In phone conversations, our daughter, April, talked of making sunflower seed milk and sunflower seed butter. When we visited her, she served the sunflower seed butter. Delicious! In the grocery store, I noticed the price of sunflower seeds – way less than cashews. “Why not sunflower seed gravy?” I asked. So I dutifully followed Gloria’s “recipe” for cashew gravy base and made a gravy base from sunflower seeds. With a little tinkering, I made a base that tastes about the same as hers for a lot less money. At this point Gloria, eyebrows raised, cleared her throat empahtically. What is a gravy base? The essential liquid portions of gravy. 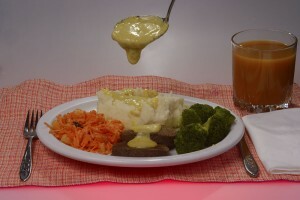 To turn the base into gravy, we use a variety of flavors depending on our dish. Our favorites are my chicken seasoning or my vegetable “bouillon,” or soy sauce substitute. Gloria is using it to concoct some desserts. This base accepts any flavor we use with it. The picture below shows our lunch from yesterday. 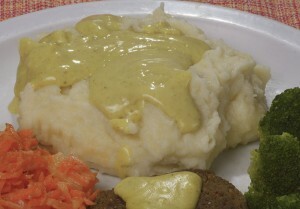 To make the gravy, Gloria added one heaping teaspoon of our chicken seasoning to one cup of gravy base. That was drizzled on some of our sage seitan sausage patties and fresh mashed potatoes. Served too was a side of carrot salad and steamed broccoli. To drink we had apple-apricot nectar. Our gravy cashew/sunflower gravy base can make an ordinary meal extraordinary. Sort and wash the nuts or seeds. Simmer in a saucepan with 2 cups water for 5 minutes. Add 1 cup of the water. Blend until it gets too thick to easily stir, then add portions of the remaining water to keep the blender running smoothly. Test the mixture for smoothness. Stop blending periodically and rub a drop between your fingers until it feels smooth. When it does, place a drop on your tongue and check for smoothness. Your tongue is more sensitive than your fingers. Add the cornstarch and any remaining water. 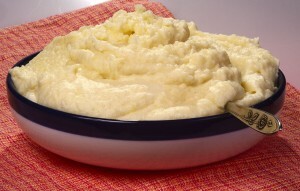 Continue blending until the starch is thoroughly mixed. Return to the saucepan. Stir over medium low heat, until the sauce thickens and just begins to boil. The base can be flavored and used immediately. We often double the recipe and freeze the base in 1 cup packages. [br] [br]Most of the time, the base is too thick to use as is. It may require adding as much as 1/2 cup water for each cup of base to get a good texture. Add the water slowly and whisk the base to get the texture you wish. We have used this base in a large number of recipes from a creamy macaroni casserole to calzones to desserts, as well as biscuits and gravy. These will all be the subject of future posts. When you try our recipes, let us know how it goes for you.